Available again if you missed it, but limited to one free NeilMed product per household. 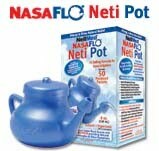 Visit NeilMed Neti Pot and “Like” them to receive a free NasaFlo Neti Pot (go to “Free Neti Pot” tab). Or you can receive a free Sinus Rinse bottle (choose one, you can’t get both freebies). Take the short survey and register will receive one free by mail along with two packets of nasal wash. Go to the “Free Neti Pot” tab and then look for “Click here for free NeilMed NasaFlo Neti Pot” to fill out the form. You will receive an email confirmation (you don’t need to click on anything in that email). Remember that if you already successfully registered for the free Neti Pot or free Sinus Rinse, you are not eligible to receive another freebie from NeilMed (limit is one freebie per household). I just received my free Neti Pot yesterday! Thanks goes to MoJo Savings for bringing this returning freebie to my attention! Interact with 92,969 fellow freebie lovers and “like” Freebies 4 Mom on Facebook. I am waiting for your next one.I hope i will get soon. I got the bottel before Chrsitmas through non facebook but just got my pot in the mail this week (both came with samples). You got to love freebies. Thanks Freebies4Mom. I signed up for the neti pot a long time ago and still haven’t received it. I’m going to try again but i’m highly doubting it’ll come. How awesome! I got the WORST colds and sinus infections while I was pregnant, but couldn’t take anything. The Neti Pot was a life saver!! I hope I get it this time. I have really wanted to try one of these things. Hoping this will help make my winter healthier. Am sooooooo happy. I missed this the last time it went around and I really wanted to try it because a friend of mine said it would really help my allergies. Yay! If it works for me they will have a dedicated customer for life. I have so much problems with my allergies but due to health reasons don’t take medication for allergies.